What I do professionally every single day is match the scientific claims by the prosecution to the facts of the case so the defense can provide the best evidence to show how either the science doesn’t match up to the prosecutorial narrative, or that the claims of the science advanced by the prosecution is invalid or constitutes classical over-reaching. I prefer to be the one in the courtroom who does the actual cross-examination of the prosecution expert witnesses and to conduct the direct of the experts called by the defense, but I have also just been a consultant matching the trial lawyers up to the experts and preparing the experts for trials and depositions. I have done so in several high profile cases. Sometimes, my involvement is well-known. Sometimes not. Matching up the perfect expert with the facts lets the truth come out and ensures that there is not an improper conviction. We covered here before, the science of the arrest report in the Justin Bieber case: The science of the Justin Bieber DUI case: How a lawyer-scientist can help. Now it is time to look at the analytical chemistry that the prosecution would like to use in the case. As has now been publicly revealed, (credit TMZ.com), Justin Bieber’s analytical chemistry result is in. Here it is in full: Justin Bieber toxicology report. So he is convicted of the DUI, correct? There are many things that we need to note with this report. 1. The alleged Marijuana detected is not an active metabolite. It is totally irrelevant. The 11-nor-9-carboxy-THC (THC-COOH) that is reported by the laboratory is not pharmacodynamically active (in other words, it is pharmacodynamically inactive). It cannot impair. It’s presence is not relevant to the issue of impairment. If this is the only form of THC that the laboratory tests for, then a simple motion in limine should exclude this result from any trial. However, if it is the only form of THC reported, but the laboratory can successfully test for the other forms of THC such as the parent drug Tetrahydrocannabinol and the first pass active metabolite 11-Hydroxy-Δ9-tetrahydrocannabinol (11-OH-THC) and both are absent, then I, as a trial attorney might want this evidence of THC-COOH admitted as evidence as it can be inferred that the marijuana use was some time in the very distant past. 2. It is a urine test. Florida is what we in DUI enforcement and defense circles call an “impairment time of driving state.” What this means is that the prosecution must show beyond a reasonable doubt that Justin Bieber was impaired at the time of driving due to this or these drugs. There is no magical quantitative number that will tell us that. No expert can validly opine based upon an analytical chemistry result alone that a certain level equates to impairment. (Please see the following post: Elucidating Pharmacodynamic Effect from an Analytical Chemistry Result). Urine in particular, is nearly worthless when it comes to determining impairment in general. Urine can be thought of like a trash can out at the curb on trash pickup day that has leftovers in it. The “positive” for Alprazolam is also potentially misleading to the ultimate issue of impairment. Alprazolam is extensively metabolized in humans, primarily by cytochrome P450 3A4 (Cyp3A4), to two major metabolites in plasma: 4-hydroxyalprazolam and α- hydroxyalprazolam. If the laboratory can detect the metabolites and the metabolites are not present in the results, then the opinion that Alprazolam is present is suspect. Plus, if it can be detected as noted above by the APA for quite some time, what is it’s possible relevance? Again, the crime is “at the time of driving,” not for taking the drug (even if he did not have a prescription). The same analysis of the urine result for marijuana is even worse in terms of its relevance for the issue of impairment. As I wrote in a blog article, marijuana is subject to lipid-release. (Here is that blog post: Why per se Driving Under the Influence of Drug Based Prosecution is Not Scientific and How Probation Violations for Marijuana Use May Be Wrong). THC is highly lipid (fat) soluble and does so quickly. 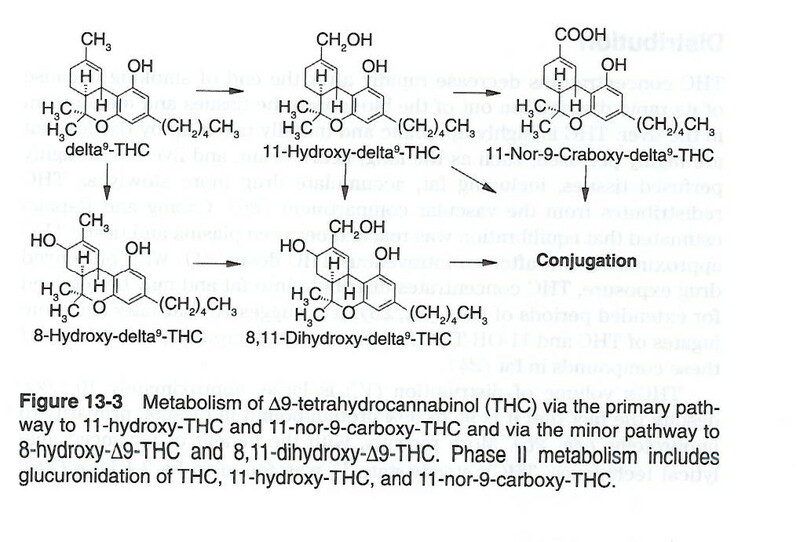 As we can see from the below figure, THC remains in the fat stores for a very very long time. The inactive metabolite builds up in the fat stores in a person. This is why the common urban legend is that a “marijuana positive will show up for sometimes 30 days” is indeed true. Of course, detection limits entirely depend on the sensitivity of the assay and the analytical capabilities of the GC-MS instrument used. We need to know more, but what we do have is not promising for the state. This urine test cannot be used to confirm that he was under the influence at the time of driving. Further even NHTSA technical paper on marijuana clearly states that interpreting marijuana results is fraught with peril and an excerpt from the report. It is inadvisable to try and predict effects based on blood THC concentrations alone, and currently impossible to predict specific effects based on THC-COOH concentrations. It is very easy to make mistakes with urine testing. On site testing at the time of sample collection must be done to test for creatinine or specific gravity to determine whether a sample has been diluted with water or the client is consuming excessive fluids to lower the concentration of drugs below detectable levels or that the urine is concentrated to over-report the drug. False-positive results that mistakenly find the presence of a substance can result from laboratory errors (e.g., outdated reagents and labeling mistakes), contaminated pipettes, specimen tampering, poor extraction techniques, poor hydrolysis techniques and/or poor mass spectral interpretation have been known to happen. Analytically, we know that marijuana in any form is very “sticky.” It has been known to collect in an injector port of a GC-MS for a long time. There are some reports of analytical carry-over when a sample prior to our unknown (i.e., the sample before Bieber’s) also has THC or its metabolites in it. This has been a known problem especially when standards that contain THC or its metabolites come before an unknown like Bieber’s. There is one way to combat against this. That is to run a blank test right before Justin Bieber’s. This is far from normal practice in a crime laboratory. Further, as recently discovered and published in the Journal of Analytical Toxicology (January/February 2012, Voume 36, No. 1, pages 61-65) entitled “Production of Identical Retention Times and Mass Spectra for Δ9-Tetrahydrocannabinol and Cannabidiol Following Derivatization with Trifluoracetic Anhydride with 1,1,1,3,3,3-Hexafluoroisopropanol” by Rebecca Andrews and Sue Paterson informs us of the possibility of error in examining biological samples (plasma or whole blood) in this crucial preparative chromatography step. The THC assays that use the TFAA (trifluoroacetic anhydride) derivatization methods have been found to result in converting cannabidiol (CBD) to the same derivatives as THC. The CBD derivatives have the same GC retention times and mass spectra as the THC derivatives. The authors conclude that when targeting and attempting to quantify, this derivatization method must not be used as it can produce a false positive in terms of the qualitative measurement, and even if objectively present, will overstate the true blood concentration. 3. It is a preliminary report. What do you call an opinion with no data to support it? A guess. So far, there is not a lot of science in the Justin Bieber case.